1. Simmer the noodles in a large saucepan of boiling water for 4 minutes. Drain and rinse under cold water, then toss with 1 tsp sesame oil. Divide between 4 bowls. Return the pan to a high heat with the sunflower oil. Fry the corn for 5 minutes until the kernels start to char. Tip half the corn into a blender and the other half into a bowl. 2. Pour 1 litre of just-boiled water into the saucepan and whisk in the miso until combined. Pour half of this miso soup into the blender with the corn and add the white parts of the salad onion and remaining ½ tsp sesame oil. Whizz until smooth. 3. Pour this blended soup back into the pan with the plain miso soup, and set over a medium heat. Add the spinach, and simmer for 1-2 minutes until just wilted. 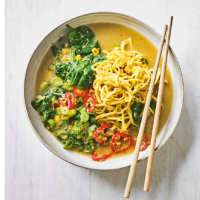 Ladle the soup over the noodles and scatter with the reserved corn, onion and sliced chilli.